Staff Viewpoint: Is Capcom turning into a bad videogame company ? Capcom, a japanese videogame publisher and developer company that's head office is in Chūō-ku, Osaka that originally established in June 11, 1983 with its US counterpart in San Mateo, California originaly established in August 1985. When talking about their games they've published and developed, Capcom is mostly famous for their well-known franchises like Megaman, Street Fighter, Resident Evil, and much more, but they're also famous for their underrated franchises such as Breath of Fire, Strider, Okami and much more. Back then, Capcom had a decent amount of respect for their consumers, sure they've made mistakes here and there but in truth every videogame company can make a mistake every once in a while so it's somewhat common with this videogame company too, and they've also did good plan decisions just like any other videogame company do, and most of them were nintendo related ! like localizing Tatsunoko vs. Capcom to the US, Europe and Australia which was a very risky plan, making a great 8-bit sequel to megaman with Megaman 9, localizing the remake of (previously known as) Turnabout Trial to the US, Europe, and Australia known as Phoenix Wright, and much more. Now granted, Capcom did apologize to some of these actions and gave their reasons as to why they are doing this while also defending themselves and also, they are doing some good actions recently like making Monster Hunter 4 for the 3DS, they are possibly bringing a long awaited sequel to Darkstalkers but what do you think about all of this, Wiiware Wave staff ? Is Capcom turning into a bad videogame company or not ? To be completely honest, Capcom is not a horrible videogame company, but they are doing a lot of frequent mistakes that is certainly ruining Capcom's image to some people's eyes, and I do think that certain actions like cancelling Megaman Legends 3 and banning facebook and youtube accounts is taking it too far, and I know that they are a business and they're here to make money, but don't "bite the hand that feeds you" by pulling bad moves like this as well as others, however I do think that Capcom has a chance of cleaning their image to some people's eyes and while they did apologize to some of these actions, remember that actions speak more louder than words. So as for my final answer, they kind of are thanks to some actions that they've pulled, but they do have an opportunity to redeem themselves and I also still give them respect in some ways. In the alternate universe where the Nintendo 3DS launch on March 27 with excellent selections of launch titles, apps already available, and the price tag of $169.99 Capcom will still cancelled Megaman Legends 3.They're good when it comes to exclusive titles that aren't cash-ins. That's all I have to say about Capcom so far. Yes, I think they are evil, and as such will not be purchasing their games anymore. Five of the best Resident Evil games, Monster Hunter Tri, Okami, the Phoenix Wright WiiWare trilogy, and some may argue Zack & Wiki, Tatsunoko vs Capcom, We Love Golf and Mega Man 9 and 10 are another big titles for the Wii. I think they did a pretty good job (second to Nintendo) in the last five years. They definately spared us Wii/Nintendo owners of most of their "controversial quality" titles. And another big plus is that they brought the best graphics and best online to Wii with MH3. For happening months ago, many of the things Capcom has done will never die on the internet I'm afraid. As a consumer who relies heavily on Capcom's yearly releases, I don't give a damn what the company has decided. Aside from Mega Man Universe, most of its decisions were very reasonable. I don't see how letting it get to you to the point of absolute rage will help it whatsoever, but maybe that's just me. The only thing that bugs me, isn't even a concern people seem to recognize. Ever. The fact Capcom re-releases the same old games for every new platform that exists, has become tradition to them. You can find Resident Evil 4 on over 5 consoles alone. And that's just one game. Many quick-money-ports are easy for the company to gain easy money. Capcom was a major source in the 80's up until the mid 90's, but they aren't as prominent as they were in that time period. But like SKTTR said, they're still doing a pretty good job. And I don't see them disappearing from the videogaming scene anytime soon, if ever. Re: Staff Viewpoint: Is Capcom turning into a bad videogame company ? The article is now released guys ! Good article and I like how you've provided multiple opinions rather than just one of a single author. I personally feel that the quality of Capcom's games hasn't dropped at all since the 80s and 90s. It's also worth noting that it released not one, not two, but more than five versions of Street Fighter II back in the day. 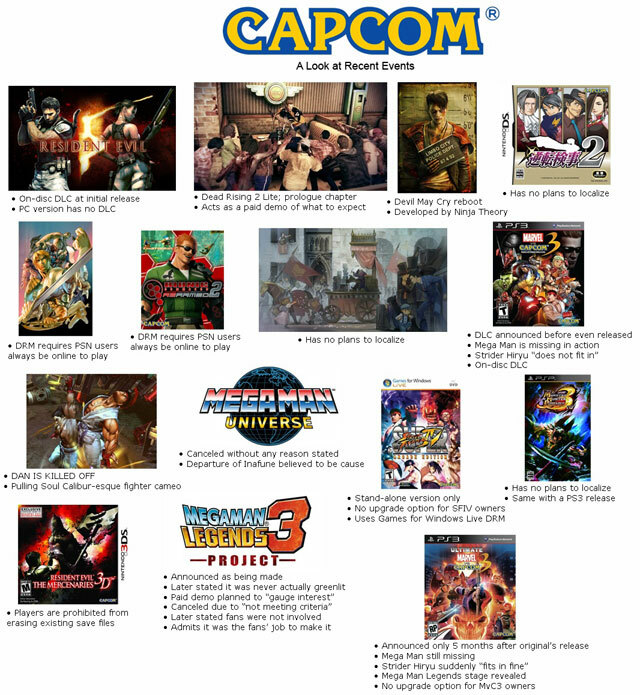 Some of those came within the same year, just like Marvel VS Capcom 3 and Ultimate Marvel VS Capcom 3. Compare that to Street Fighter IV, which has three main versions, one of which allows you to upgrade from the previous version. The upgrades also have a lower price than the original versions. Regarding the lack of translating Miles Edgeworth, there were plenty of games that Capcom wouldn't translate back in the day due to audience issues. Considering that the original didn't sell very well and the translation can be costly, why should Capcom have translated the sequel for a non-receptive audience? Maybe I'm hallucinating, but I recall hearing that Okamiden sold more in a few weeks/months than Edgeworth did in an entire year. Similarly, Monster Hunter has some devoted fans, but it doesn't exactly fly to the top of the charts elsewhere. The inability to erase save data on Resident Evil: The Mercenaries 3D is nothing new to modern 3DS gaming (see BlazBlue, Super Monkey Ball, etc.) or to the games of yesteryear. There's even a way around it. Honestly, I can't think of any reason for the lack of Mega Man Legends or Mega Man Universe or Mega Man in MvsC (especially since Zero and Tron Bonne are in the game). I certainly can't excuse the bad PR. That said, I think that if Capcom is "turning into" a bad company, it already was before and we're only making a big deal of it now because of poor public relations and the well-publicized internet era. It's out there to earn money and it does so by making use of its properties and games as much as they humanly can with all the ports Viewtiful Joe mentioned. Capcom has always made strange and controversial moves, but at least many critics and fans agree that the quality of . Um....why are they letting Megaman die? Hell yeah with as many insults to their consumers, and how many stupid business moves they have made recently it's amazing they're not bankrupt already. @Yoshi why didn't you finish your post?